Keeper's Cottage01263 715779work01603 870304fax Self-cateringArise in the morning and enjoy serene views of private woodlands fronted by a lake … without getting out of bed! 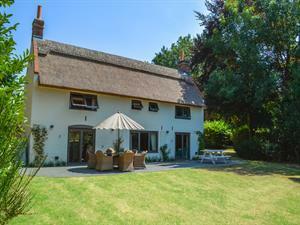 Welcome to Keepers Cottage, a newly restored thatched cottage, which has been finished to a high standard and is located in a tranquil spot in this lovely part of Norfolk. To relax, enjoy using the owners’ indoor swimming pool or get out in the fresh air and take a stroll along one of the marked woodland trails. The beaches to the east of the county and the Norfolk Broads are both within easy reach and offer great days out. Enjoy playing in the dunes or building sand castles at the vast sandy beaches of Sea Palling or Winterton-on-Sea and make memories to treasure. Or explore the beautiful Broads, which are made up of rivers and wide expanses of water, are richly inhabited by wildlife and best explored afloat by boat, yacht or canoe, which you can hire from one of the many operators within the area. Steeped in history, Norwich is close by, with its Cathedral, Museums and a good range of shopping facilities, restaurants, historic pubs and cafes. Keeper's Cottage is an away-from-it-all holiday home that is close to everything - how perfect is that? • Please note - Guests can enjoy use of the owners swimming pool for a 6 hour slot daily between 10am and 4pm by mutual arrangement. There is no lifeguard, so an adult must supervise children of any age at all times whilst close to the water and no one is permitted to swim in the pool on their own. Arise in the morning and enjoy serene views of private woodlands fronted by a lake … without getting out of bed! Welcome to Keepers Cottage, a newly restored thatched cottage, which has been finished to a high standard and is located in a tranquil spot in this lovely part of Norfolk. To relax, enjoy using the owners’ indoor swimming pool or get out in the fresh air and take a stroll along one of the marked woodland trails. The beaches to the east of the county and the Norfolk Broads are both within easy reach and offer great days out. Enjoy playing in the dunes or building sand castles at the vast sandy beaches of Sea Palling or Winterton-on-Sea and make memories to treasure. Or explore the beautiful Broads, which are made up of rivers and wide expanses of water, are richly inhabited by wildlife and best explored afloat by boat, yacht or canoe, which you can hire from one of the many operators within the area. Steeped in history, Norwich is close by, with its Cathedral, Museums and a good range of shopping facilities, restaurants, historic pubs and cafes. Keeper's Cottage is an away-from-it-all holiday home that is close to everything - how perfect is that?